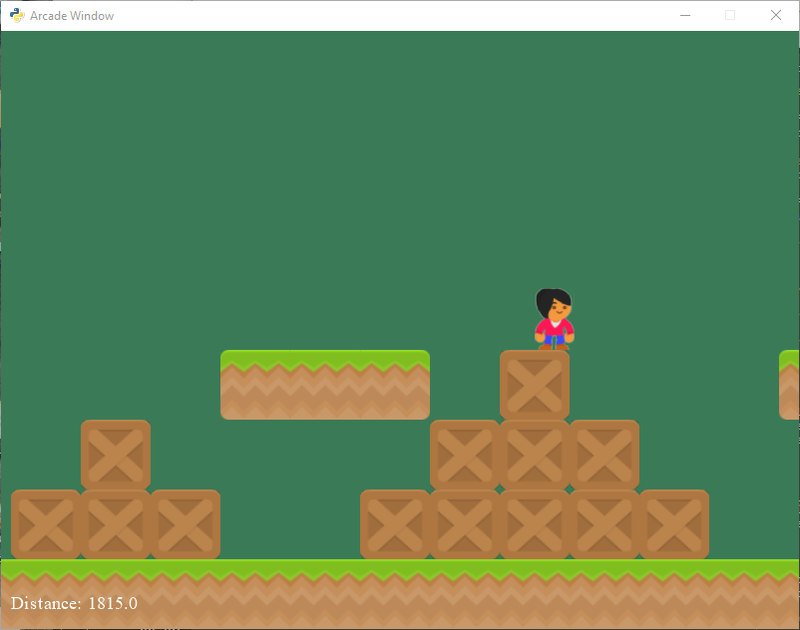 Learn how to get started with Arcade, an easy-to-use Python library for creating 2D video games. Python is an outstanding language for people learning to program, and perfect for anyone wanting to "get stuff done" and not spend heaps of time on boilerplate code. Arcade is a Python library for creating 2D video games that is easy to start using, and very capable as you gain experience. In this article, I will explain how to start using Python and Arcade to program video games. I started development on Arcade after teaching students using the PyGame library. I taught in-person using PyGame for almost 10 years, and I developed ProgramArcadeGames.com to teach online. PyGame is great, but eventually I felt like I was wasting time having to cover for bugs that were never fixed. I worried about teaching things like the event loop, which was no longer the way we code. I had a whole section in which I explained why the y-coordinates were reversed. Because PyGame was seldom updated and it is based on an old SDL 1 library, rather than something like more modern like OpenGL, I didn't hold a lot of hope for the future. I wanted a library that was easier to use, more powerful, and used some of the new features of Python 3, like decorators and type-hinting. Arcade is it. And this is how to get started. For more detailed installation instructions, you can refer to the Arcade installation documentation. The script below shows how you can use Arcade's drawing commands to do this. Note that you don't need to know how to use classes or even define functions. Programming with quick visual feedback is great for anyone who wants to start learning to program. # Set the background color to white.
""" 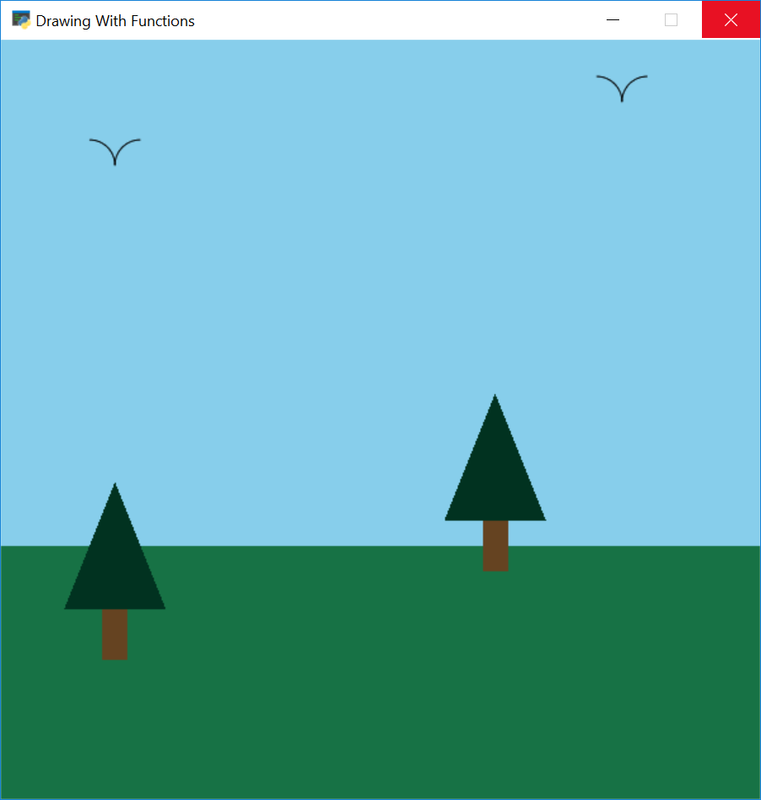 This function draws a pine tree at the specified location. """ # Draw the triangle on top of the trunk. # We need three x, y points for the triangle. For the full example, see drawing with functions. The more experienced programmer will know that modern graphics programs first load drawing information onto the graphics card, and then ask the graphics card to draw it later as a batch. Arcade supports this as well. Drawing 10,000 rectangles individually takes about 0.800 seconds. Drawing them as a batch takes less that 0.001 seconds. Larger programs will typically derive from the Window class, or use decorators. This allows a programmer to write code to handle drawing, updating, and handling input from the user. 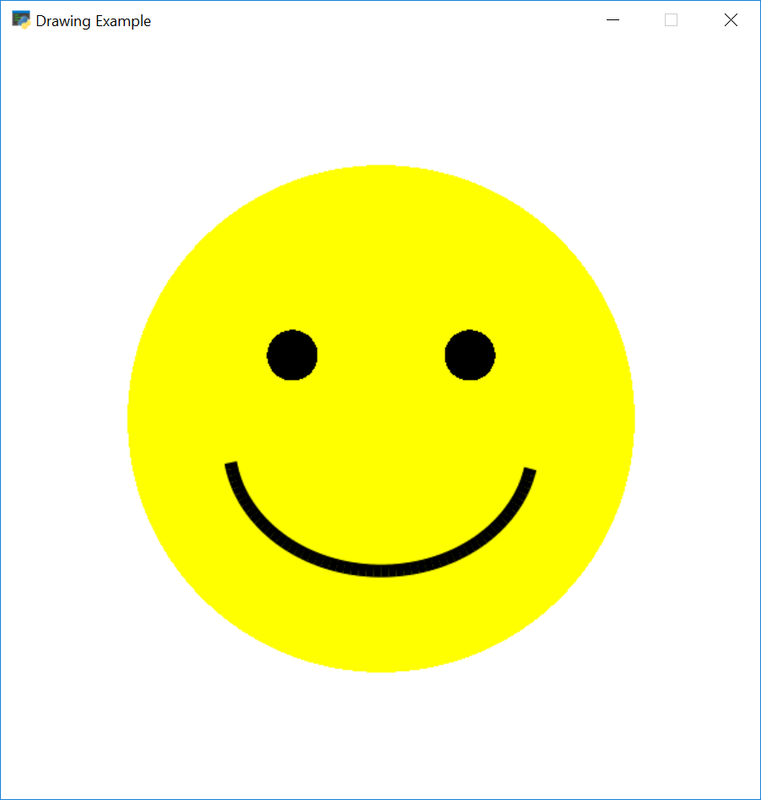 A template for a starting a Window-based program is below.
""" Render the screen. """ """ All the logic to move, and the game logic goes here. """ on_draw: All the code to draw the screen goes here. update: All the code to move your items and perform game logic goes here. This is called about 60 times per second. on_key_press: Handle events when a key is pressed, such as giving a player a speed. on_key_release: Handle when a key is released, here you might stop a player from moving. on_mouse_motion: This is called every time the mouse moves. on_mouse_press: Called when a mouse button is pressed. set_viewport: This function is used in scrolling games, when you have a world much larger than what can be seen on one screen. Calling set_viewport allows a programmer to set what part of that world is currently visible. Sprites are an easy way to create a 2D bitmapped object in Arcade. Arcade has methods that make it easy to draw, move, and animate sprites. You can also easily use sprites to detect collisions between objects. This code will create a sprite using the image stored in coin_01.png. The image will be scaled down to 20% of its original height and width. Sprites are normally organized into lists. These lists make it easier to manage the sprites. Sprites in a list will use OpenGL to batch-draw the sprites as a group. The code below sets up a game with a player, and a bunch of coins for the player to collect. We use two lists, one for the player and one for the coins. The function check_for_collision_with_list allows us to see if a sprite runs into another sprite in a list. We can use this to see all the coins the player sprite is in contact with. Using a simple for loop, we can get rid of the coin from the game and increase our score. 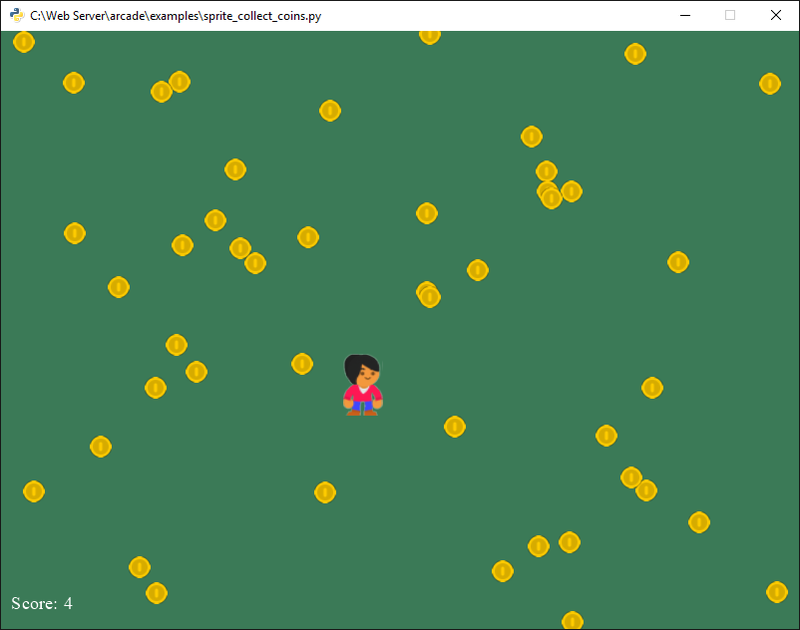 # Generate a list of all coin sprites that collided with the player. For the full example, see collect_coins.py. Many games include some kind of physics. 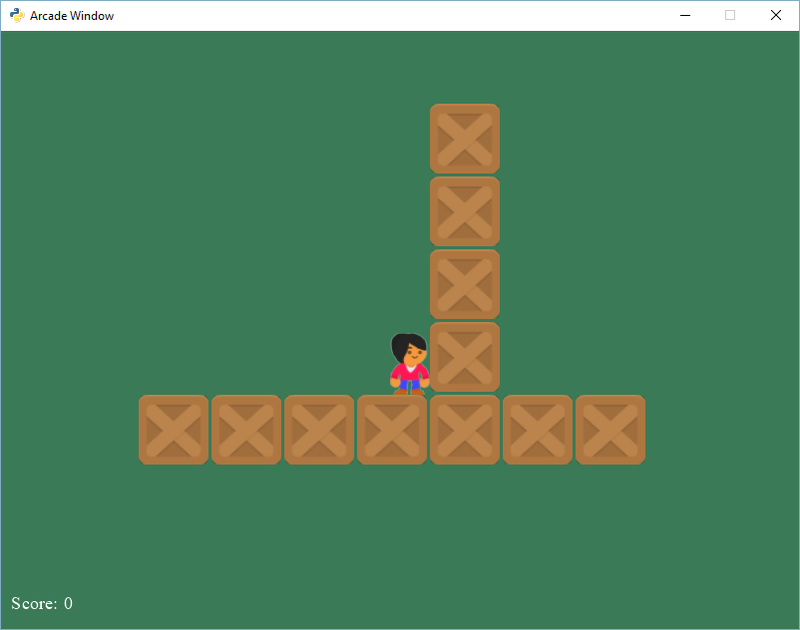 The simplest are top-down programs that prevent the player from walking through walls. Platformers add more complexity with gravity and platforms that move. Some games use a full 2D physics engine with mass, friction, springs, and more. Although that code sets the player's speed, it doesn't move the player. In the update method of the Window class, calling physics_engine.update() will move the player, but not through walls. For a full example see sprite_move_walls.py. Moving to a side view platformer is rather easy. A programmer just needs to switch the physics engine to PhysicsEnginePlatformer and add in the gravity constant. You can use a program like Tiled to lay the tiles/blocks that make up your level. For an example, see sprite_tiled_map.py. For full 2D physics you can integrate the PyMunk library. One of the best ways to learn is by example. The Arcade library has a long list of example programs that a person can draw on to create games. These examples each show a game concept that students have asked for in my classes or online over the years. Arcade lets you start programming graphics and games with easy-to-understand code. Many new programmers have created great games not long after getting started. Give it a try! To learn more, attend Paul Vincent Craven's talk, Easy 2D Game Creation With Arcade, at PyCon Cleveland 2018. Paul Vincent Craven - Paul Craven is the author of "Program Arcade Games with Python and Pygame", an on-line and in-print resource for learning to program. He is the primary maintainer of the Arcade Python game library for 2D graphics. Paul is also a professor at Simpson College in Iowa. Great for open source game competition! Tl;dr: in replacing PyGame you've managed to do precisely the same core mistake and made it too annoying to get your library up and running in at least what I think of as a sensible manner (subjective for sure). First: Python 3.6 is a pain because it's so new, most distributions haven't even included 3.anything but at least getting 3.5.x up and running is fairly easy on most distributions as far as I know, but 3.6.? Compiling from source and wrestling with getting added bits and bobs and whatnot actually working? Who hasn't wasted far too many hours on stuff like that? You're not helping yourself. This is the prefect mirror image of PyGame not supporting whatever Python people already have. In PyGame it's because PyGame is old (and broken) and in Arcade it's because the Python is too new. Same difference. Okay if you run in dedicated environments etc. but not for normal people at home wanting to take a peek and get right into it at minimal cost. Second issue: pip, is it still a completely open and non-reviewed security issue as per the year-old report from that Czech intelligence agency? Should anyone be using pip at all? Despite all that your actual library looks interesting, too bad I'm tired of hoops. You are right that 3.6 is a pain to get up and running with some Linux distributions. With Windows, MacOS, and Ubuntu it will be default version for people doing a recent install. Not so much with Linux Mint or some other ones. I'll think about your comment seriously. I quite like the new print formatting, but it isn't used a lot in the code. If you don't like pip, install Arcade using setup.py. I'm not quite sure what you are looking for here. I just installed it on Linux and will try it out very soon. It looks great. I like PyGame, but it *is* showing its age, so this is a hugely welcome development. Wow, Paul, this library looks really promising. Last year I ran a Python class with 10-13 year olds and PyGame. Though it went well, I was occasionally frustrated by the limitations of the PyGame library and the confusing state of the docs. Can't wait to try out Arcade!